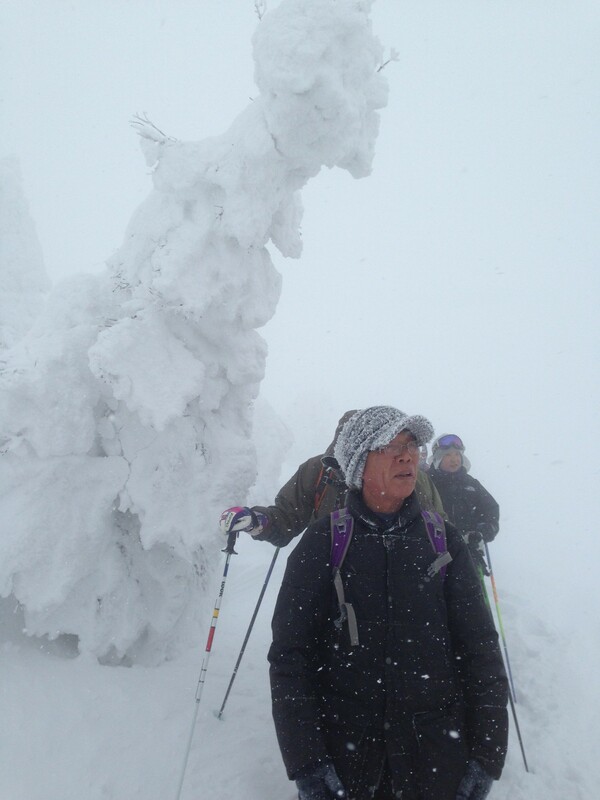 A millisecond after looking at National Geographic magazine photographs of the snow monsters of Zao, Yamagata Prefecture, Japan, I was compelled to snowshoe amidst the real beasts in their icy flesh. My first attempt to travel there last year was sabotaged by a severe rain storm. An unusually heavy snowfall closed all roads to Zao just before my second attempt earlier this year. In late February, though, the gods of weather, mountains, and work schedules allowed my wife and I to embark on a magical snowshoe tour to see the actual snowy creatures. Snowshoeing in the volcanic mountain range around Zao is like being an astronaut exploring another planet. Zao is home to an amazing natural phenomenon—a mountain peak covered with thousands of snow monsters. The snow monsters are actually tall Maries’ fir (Abeies mariesii) trees that thick layers of rime frost and wind sculpt into strangely shaped beings. These develop when tiny drops of water vapor in fog or mist land on tree leaves or branches and freeze. More drops fall on those frozen ones. Eventually, the entire trees are encased in rime ice and snow. Each tree is transfigured into something unique and otherworldly. Depending upon weather conditions and your imagination, the encapsulated trees may appear as dinosaurs, giant animals, or aliens in cocoons. Hence, the people of Zao call them snow monsters. In only a few locations of the world do the right combination of moisture, wind, leaf structure, and subzero temperatures combine to create snow monsters. 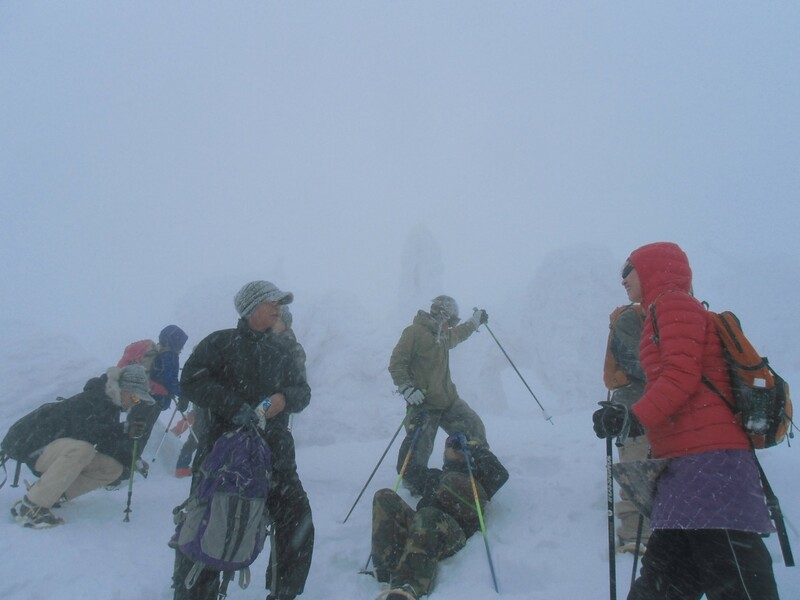 In Japan, these conditions exist on just a few isolated peaks in the north of the main island of Northern Honshu. The magical transformation from tree to snow monster lasts for just a few months. Snow monsters are usually born in December and develop into their statuesque adult forms by early February. In late March, the ephemeral rime coating starts to melt and the monsters morph back into normal trees. 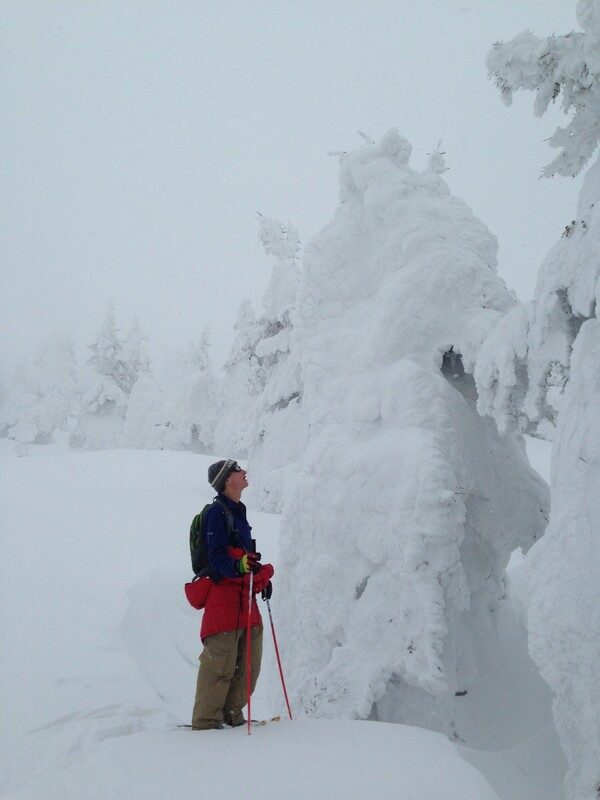 Locals say that February is the best month to join a tour to snowshoe among the snow monsters. Tours start just before nine in the morning at the office of the Zao Onsen Tourist Association. The tour costs 4,000 yen (about US $38). This price includes the use of a pair of Japanese kanjiki (the traditional circular snowshoes of Japan) and stalks. The price does not include an additional 2,500 yen fee for two gondola tickets, one for a ride to the top of Mt. Jizo, where trekking starts, and another for a ride from a lower peak back to town. We floated up the snowy mountainside in a small gondola packed with skiers, snowboarders, snowshoers, and snow-monster tourists. My tour group members chatted amiably while looking out the wide windows at a panoramic view of coconut-milk-white mountains, curving ski slopes, steep precipices, and snow-covered vegetation. The stages of transformation of evergreen trees to snow monsters were easy to observe. Near the base of the lower ski runs, the conifers below the gondola looked like ordinary trees with clumps of snow balancing on branches. Going higher, the trees became increasingly covered with snow and ice, but they retained their treelike shape. Finally, at elevations above 1,400 meters, the trees no longer resembled trees. The rime-frost had completely transformed ordinary trees into mysterious beings. After stepping from the gondola at the Jizo Sancho Station on Mt. Jizo (elevation 1,661 meters), our tour guides, Yoshida-san (Mr. Yoshida) and Itoh-san (Mr. Itoh), called the tour members to form into a circle. They taught us how to tie the circular wooden kanjiki to our boots with natural fiber rope. As Mr. Yoshida laconically stated, walking with kanjiki is easy, correctly tying them to the feet is a pain. It took me several attempts to get it close to right. Mr. Itoh finally did it for me. Mr. Itoh was a colorful character with a saucy sense of humor. As he taught me to tie the kanjiki, onto my boots, he made language puns in Japanese. The Japanese words for rope and gigolo are homophones. Itoh was born in Zao and except for his college years in Tokyo, he has lived his entire life in Zao. He both runs a small Japanese inn, Itoya Ryokan, and guides visitors throughout the nearby mountains, which are his backyard, so trekking up and down them is his almost daily commute. For a sixty-five-year-old man, he is extremely athletic. Itoh speaks English well enough to help foreigners to understand the ecology of Zao. Our kanjiki firmly attached, we walked from the gondola into a world composed of shades of white, except for the clothing and mostly black hair of the human visitors. Crystalized hard snow crunched under our kanjiki. The sky and ground were almost the same color. Skiers and snowboarders slid down a path to the left. They disappeared into whiteness. Shivering tourists looked at the nearby monsters, took photographs, and quickly headed back inside. We walked straight about fifty meters to view a large Jizo statue that was buried to its neck in snow. Jizo are Buddhist statues that protect children and travelers. Visitors, prayed, took photographs, or dropped coins into a collection box on sleigh runners. Mr. Yoshida soon led us up a barely visible trail to the right. We ascended in the direction of Mt. Jizo’s peak (1,736 meters). The monsters stared silently. Imagine a white moonlike environment with motionless giant aliens standing all around you. 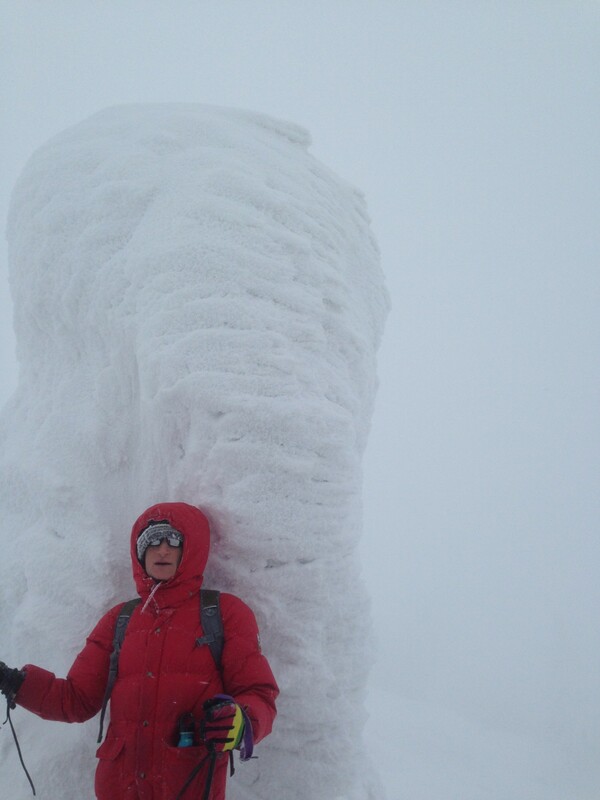 Most of the giants have circular depressions in the snow around them that are created by strong winds hitting their thick trunks and then flowing around them, like water moving around a rock in a stream. We walked single file between the snow monsters. All of us were enthralled as we wound our way up the mountain and then down another slope. Looking at the monsters, we pointed out to each other faces and shapes we perceived in them. We often saw different things; for example, I was sure that one snow monster resembled a giant elephant standing on its back feet, but my wife said it looked like an octopus. As we were zigzagging our way down the mountain, our guides often stopped to check our physical condition and to give an explanation regarding the environment. They safely led us over a swamp that was covered with at least two meters of snow. After discovering the deep tracks of Japanese serows (Capricornis crispus), deerlike ungulates, we learned that mountain climbers have observed the animals climbing up and playing on the ice-covered trees. The wind increased, snow fell faster, and visibility decreased. Mr. Yoshida asked if we wanted to return on a course that would bring us down on schedule or if would like to opt for a longer trail that would have us return later than planned. To my delight, everyone on the trail chose the longer route. 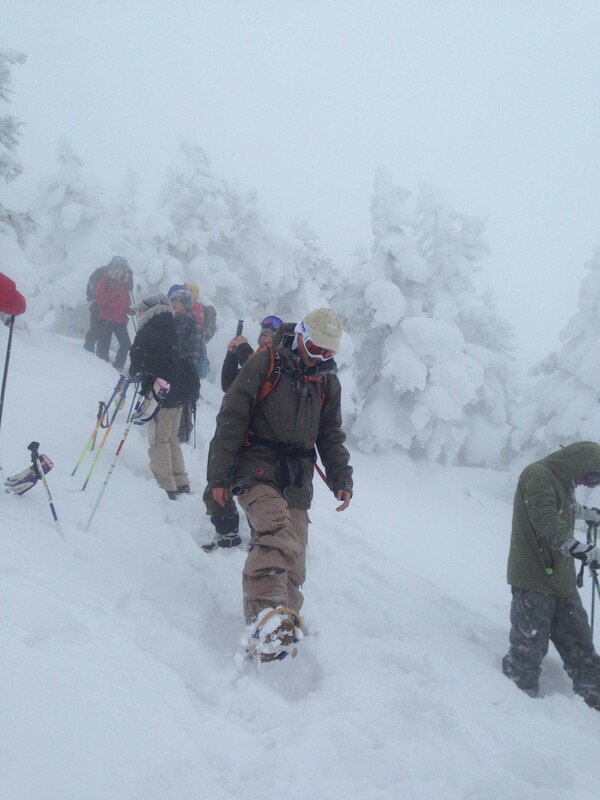 Mr. Yoshida smiled and said that he loves snowshoeing in such conditions. It wasn’t long before we were in a raging white storm. I removed my thick right glove to take more photographs. The fingers on my wind-exposed hand quickly felt as if a hammer had smashed each one. All I could do was snap two quick shots before I needed to jam my throbbing hand back into the glove. I could not feel if my fingers were where they should be in the glove or not. Slapping my hands together, I looked around me. My wife’s normally lustrous black hair now had white streaks. Ice structures that looked like white shrimp tails were forming on the ends. The temperature gauge inside the gondola hut we left an hour earlier had read -7 Celsius. That was before the wind had increased and snow flurries had blown in. My wife’s smartphone could not operate in the cold. One of our guides had stopped and was, again, intently staring, at his GPS. The immense snow monsters gazed wordlessly. We continued zigzagging single-file between the trees and down the mountain. The storm lessened its intensity, but the snow did not cease falling. 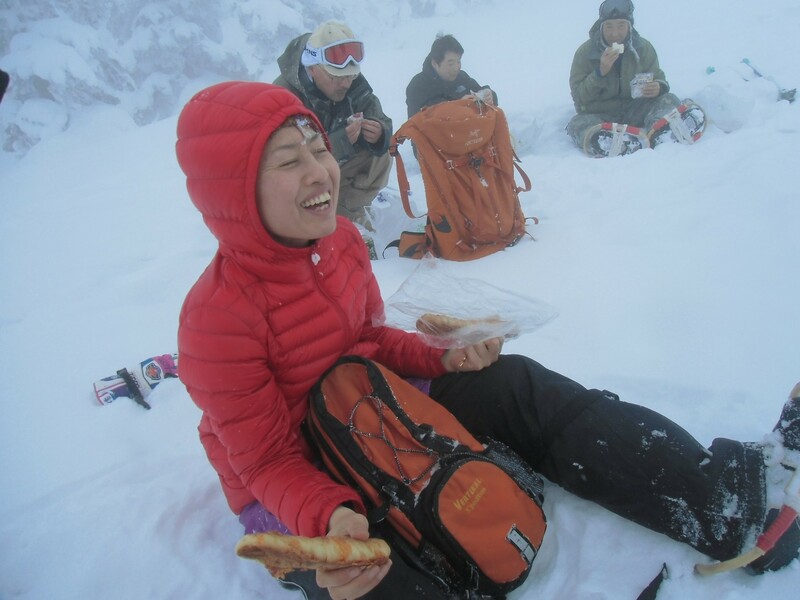 Nonetheless, it was soon time for lunch; we sat down on the frozen earth and ate rice balls, sandwiches, fruit, and other snacks that we had carried with us. After lunch, when Yoshida was staring intently into his GPS to determine the way to proceed, Ito waited a few moments and then pointed in the direction we should go before Yoshida could speak. Itoh’s presence was a great reassurance despite the fact that anything more than ten meters away disappeared into a swirling white fog. 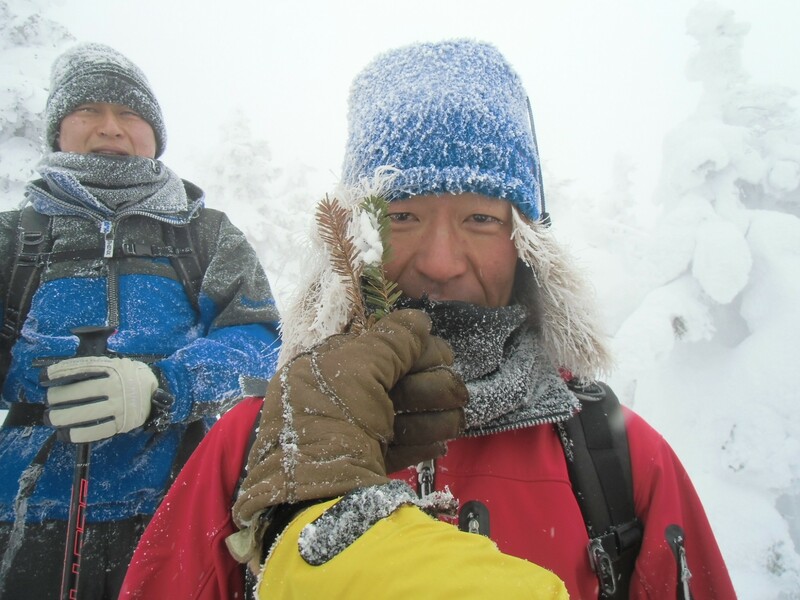 While trekking, Itoh identified the tracks of rabbits and other animals in the snow. He pointed out where rabbits had neatly cut branches with their teeth to eat tree buds. Itoh broke one of the buds under my nose, so I could smell its basil-like fragrance. I took a bite and tasted a pungent herbal sweetness. The residents of high mountain villages in Japan’s snowy regions often collect the fresh leaves of that tree and prepare them as tempura. Eventually, our guides brought us through the last wooded section of our walk, and I sadly left that amazing forest. We walked down the side of a ski run to reach another gondola for our return into town. After exiting the gondola, we were all shaking hands and saying goodbyes when a Japanese woman in her fifties approached and asked if the snowshoe tour was worth taking. Simultaneously and unanimously, all of the tour members praised the experience. Before heading for a nearby hot spring (Zao has numerous springs all over town), I looked up at the peak we had trekked upon. Dark clouds were retreating from advancing blue sky. I marveled at the quick transition of weather. The snow monsters, so large up close, were just tiny white figures in the distance. Unfortunately, like many other creatures that exist at high altitudes, the snow monsters are endangered by global warming. A recent article on Webecoist.com reported that if average winter temperatures continue to increase, the snow monsters may disappear within the next two generations. Their probable disappearance is just one of numerous reasons to both fight global warming and to enjoy snowshoeing today. This entry was posted in Destinations, Features, Homepage Featured by Greg Goodmacher. Bookmark the permalink. Really extremely interesting and well written. I could almost feel the cold when the author described the sensation when he took his glove off for a second. I do not like cold or snow, but I really enjoyed reading this article.